London broil had to be one of my very favorite dishes growing up. My mother made it often, since it was an inexpensive way to feel like you’re having steak, and I remember thinking it was the height of attainable fancy (especially when served with asparagus slathered in faker hollandaise or buttered button mushrooms). To this day, London broil – and specifically this cooking method – is my go-to when I’m tired of dithering with other cuts of meat and just want something that a: isn’t going to break the bank, b: can stretch through multiple meals, and c: feels and tastes like steak – without having to deal with trimming fat and guesstimating cooking times. My DH and I generally end up eating a generous portion for dinner, and then I use the leftovers in salads (if they make it that far) for a few days after in lunches. In celebration of her birthday this year, I’m sharing this childhood favorite with you guys – I think Mom would definitely approve of the side. Happy birthday, ma. I sure do miss you. Set your broiler on high and place the top rack as close to the heating element as you can get it. Wrap a cookie sheet in tinfoil. Place your steak on the prepared cookie sheet to come to room temperature while you make the side. Stack your bacon slices and slice into thin strips width-wise (mini lardons). Slice the onion thinly. Add to a large pan over medium heat and sautee until the bacon and onion are browned, stirring often to avoid burning. While that is working, slice your garlic cloves. 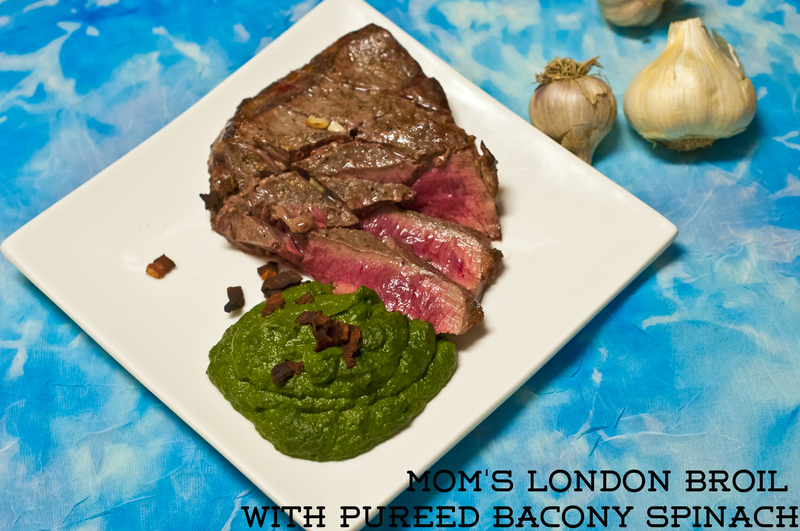 When you have half the garlic done, add to the pan with the onions & bacon – the rest is going in the London broil. When your bacon & onions are nice and browned. add the spinach. If you defrost first, your life will be easier – I never remember to, so I ended up breaking it up with a spoon as I could and stirring frequently to avoid sticking and burning. If you go this route and need a little oil, that’s ok. When the spinach is melted, add the coconut milk and stir to combine. Add a big pinch salt and a few cracks black pepper and transfer the whole mixture to a blender. Blend until smooth, adding splashes of water if the mixture gets too dry to move. Taste & add salt and pepper if needed. On to the meat. Score your London broil in a diamond pattern on both sides – slipping garlic slices into the scores as you go. Liberally salt and pepper both sides. Broil 4 minutes per side* and set on a cutting board with drip channel to rest for 5 minutes before serving. To serve, slice against the grain on a bias. The meat serves 4 for dinner or 2 for dinner + 2 lunches; the side can comfortably serve 3-4 for dinner if you’re not expecting potatoes. I might supplement with come cauliflower mash if everyone is starving. * I’ve always eaten mine rare — oh, who am I kidding – I love it blue — if your predilections are a little less macabre, adjust the cooking time to your liking – about a minute or so extra per doneness measure. 5 minutes should get you medium-rare. As always, your mileage may vary and this is just an estimated cooking time. Listen to your broiler.